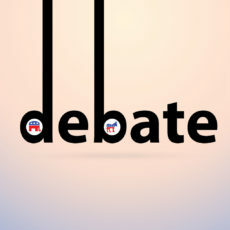 Watching the presidential debates is like watching the aftermath of an automobile accident. You’ve all seen it: people holding up traffic as they gawk at the wreckage, trying to get a glimpse of someone else’s misfortune. The presidential debates hold the same fascinating horror, except that the gawkers share in the misfortune. There’s something wrong with a political system that offers voters the choice of two candidates, both of whom are viewed as more unfavorable than favorable by voters. And yet, I find myself in odd agreement with the main messages both candidates are trying to convey to viewers. The main message Trump has tried to convey in the first two debates is that Clinton is unfit for the presidency, and the main message Clinton has tried to convey is that Trump is unfit for the presidency. I often disagree with politicians, but in this case their messages are very convincing.